This picture Rubens wrote after his marriage. On it, he depicted himself and his wife in front of a bush with honeysuckle. From the picture breathes serenity, self-confidence and happiness. Both figures are approximately the same and located near each other. With such a composition, the artist wanted to symbolize the equality of their marriage. He sits on a high bench, his wife Isabella kneels. In the pose of the artist reads freedom and ease, the leg is thrown on the leg. Before Rubens more than one artist did not portray portraits with similar compositions. Speaking about this work of Rubens, experts believe that there are not just depicted a happy husband and wife. The artist managed to capture the marriage in his work. 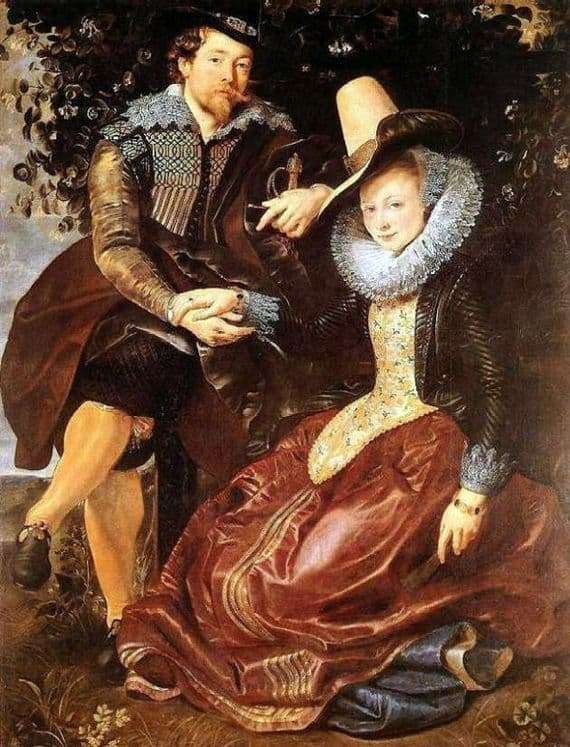 Isabella freely puts her hand on Rubens’ leg. Such a gesture symbolizes her inner confidence and freedom. In his work, the artist managed, without losing the sacred meaning of the sacrament of betrothal, to ennoble and decorate it with special warmth, trust and intimacy, using the design of links throughout the picture. All these signs symbolize the union of a young couple. So, for example, the contact of the hands of the newlyweds acts as a center of the S-like curve. It begins near the head of the artist and ends on the second hand of his wife, lowered down. The most important part of the picture is the background of the portrait depicting the real location of the spouses. This feature is especially enhanced by the level of vision, showing grass and flowers. Due to such an armhole, the picture seems lively and real, but it is completely devoid of reliable details. The artist builds a composition based on the rhythm of the forms and figures on the plane. Figures in love can be quite simply fit into the oval circle, their attire in almost the same colors.